Sophisticated Latin American fare takes DC by storm. 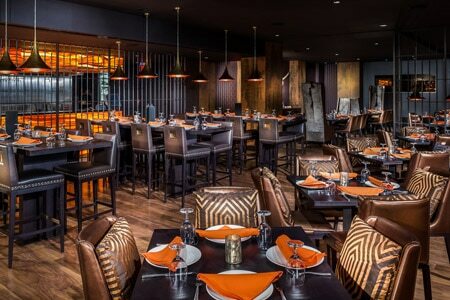 : Richard Sandoval’s Toro Toro is his most glamorous and adventurous DC restaurant to date. It combines Latin American fare upstairs (with late-night dancing) and an opulent lounge downstairs where select Latin performers take the stage. But for the foodie in us all, settling down to a long night of feasting is what makes Toro Toro so attractive. Numerous lengthy menus present decision-making challenges, but you might take the advice of the waitstaff and go for flatbreads and empanadas. And don't pass up the ceviche and tuna tacos. Entrées include the Brazilian-style churrasco and the half (or whole) rack of farm-raised lamb. The nicely cooked lamb inspires a return visit, but perhaps that would be the time to experiment with the chipotle-miso Chilean sea bass or one of the skewered meats. Dessert choices are few, but the leader is the deconstructed Key lime pie comprised of a custard and a cream meringue accented by scoops of ice cream. A robust wine list and a heady selection of Latin-inspired cocktails, including a prickly pear Chilcano, definitely add an upscale element to a meal.